Boscombe Surf Reef may seem like an unlikely place to find hundreds of forms of marine life, but BU marine biologists Dr Roger Herbert and Josie Pegg have discovered a whole underwater world over the past 3 years and they came to Cafe Scientifique to share their findings with the public. Cafe Scientifique is a concept that originated in Leeds. The idea being that for the price of a coffee or glass of wine, members of the public with a keen interest in science and technology can meet in a cafe or public meeting place and hear from academics and writers about their scientific research. It aims to bridge the gap between academia and the public; firing up interest in scientific discoveries and making scientific ideas accessible to all. No question is too left-field or silly as we’re all here to learn from each other. 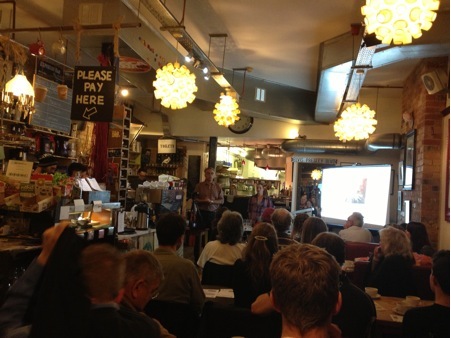 BU’s Cafe Scientifique scheme has been very successful since its launch last year and well-attended. It meets once a month at Cafe Boscanova in Boscombe. In December 2012, Dr Roger Herbert and Josie Pegg presented a talk about their work monitoring the colonisation of Boscombe surf reef by marine life for the past 3 years. They gave us a fascinating look into what they’ve discovered, showing us the various props they use for data collection and videos of their work in action. We’ve all been hearing about the Boscombe Surf Reef for many years, with numerous headlines surrounding the controversial project. While it may not have turned Boscombe into Bondi, the surf reef has had a brilliant ecological impact. Roger and Josie have discovered over 100 species on the Boscombe Surf Reef, including algae, molluscs, crustaceans and fish, all of which have been recorded since the structure was completed in 2009. Marine life can colonise structures quite quickly, whether they be wrecks or piers. This is often dependent on the substrate that the reef is made from. In the case of the surf reef, the outer substrate is a geotextile, which covers the sandbags. After one year, the reef has been colonised by a wealth of marine life. The research forms part of an on-going three year project supported by the Esmée Fairbairn Foundation, which aims to quantify the colonisation of marine organisms on the reef structure and compare the results with nearby natural rocky outcrops in Poole Bay and the artificial Boscombe and Bournemouth Pier structures. The project, which is in association with URBANE (Urban Research on Biodiversity in Artificial & Natural Coastal Environments), should influence design guidelines for future construction in the sea.